At JFK High a student is bleeding from a stab wound, the school psychologist goes nuts over the ditto (copy) machine. Another teacher reassuringly checks the snub nosed .38 tucked discreetly into her briefcase. The drivers ed training car seems to be stolen. It is all in a day's work and is just another Monday morning at JFK High School. This is an outrageously funny, dramatic and intensely human story. Teachers indeed blows the lid completely off America's troubled public schools and youths in distress. Nick Nolte gives an amazing performance as a burned out teacher after he has spent years struggling with the red tape laden system. JoBeth Williams is terrific as the feisty lawyer and ex student who awakens both his Nolte's ideals and his absent ardor. As the savvy but unyielding vice-principal, played by the great Judd Hirsch, is outstanding as he heads a fine supporting case including stars Laura Dern, Ralph Maccio, Crispin Glover, Richard Mulligan and Lee Grant. 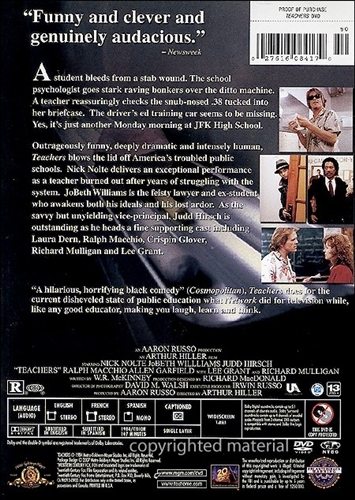 Teachers DVD 1984 grabs hold of you and doesn't let go or let you forget about the plight of these Teachers DVD and exceptional students. Teachers DVD is an interesting look at a broken school and system with some teachers that really care and want to make a difference. Teachers DVD remains a fascinating teen drama comedy from the 80s.